After Route 20 was abandoned in 1957, these rails on Old York Road in Logan continued in use, serving as a connector between Luzerne Depot and Route 6 at Olney Terminal. Here ex-Kansas City PCC 2263, a 1946 product of St. Louis Car Company, crosses Wyoming Avenue during a July 1971 fan trip. Route 6 was replaced with diesel buses in 1986. 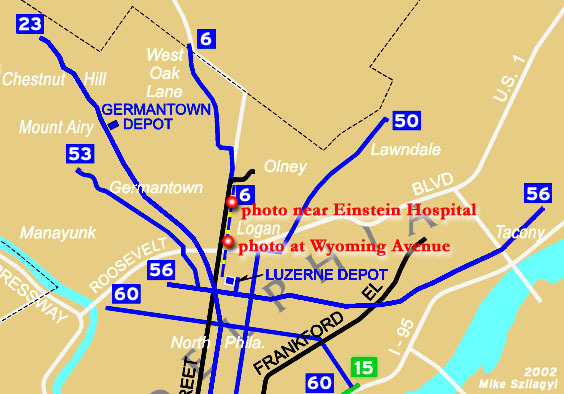 The map below shows the location of these photographs in the vast network of trolley lines that existed until recently. 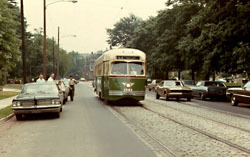 The 40 ex-Kansas City PCCs purchased by PTC in 1954 provided excellent service on Philadelphia's streetcar routes until the early 1980s. One feature of their design -- a single-piece destination sign -- restricted these cars to certain routes, notably the 50. 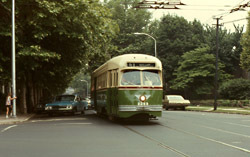 By the late 1970s, they could often be found on the Route 23, too. For this 1971 fan trip, motorman Bob Hughes has placed specially-made signs in front of the standard roll-sign for use on Routes like the 6.
click on the photos to view high-res scans! This entire network of trolley lines -- shown in blue on this map -- has been replaced by diesel bus routes over the last two decades. Only the Route 15, shown in green at the bottom of the map, is scheduled to return to trolley service, in 2003. September of this year will mark the tenth anniversary of the "temporary" use of diesel buses on Routes 23 and 56.